This training includes three components for teaching and testing map reading skills. The first, Map Reading Basics (MRB), covers terminology and concepts needed to read and understand an underground coal mine map. An opportunity to practice using those skills while navigating through a simulated mine is provided in the second part, Mine Navigation Challenge (MNC). These two parts can be used together or separately according to trainee needs. 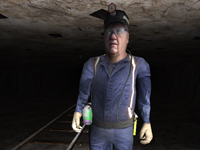 Trainees can get additional practice by going on a scavenger hunt in the simulated mine. After completing training, participants will be able to read a mine map to identify and navigate to specified locations in an underground coal mine. Skills Reviewed: The trainee will utilize map reading techniques to effectively and safely navigate a coal mine and identify in-mine cues used for mine navigation. Installation notes: Download the appropriate ZIP archive for the version of Windows® you are using (32-bit or 64-bit), unpack into a temporary folder and double-click Install.htm. If you are not sure what version of windows you are running go to this Microsoft® site for help.